Every year, the people of the Protectorate leave a baby as an offering to the witch who lives in the forest. They hope this sacrifice will keep her from terrorizing their town. But the witch, Xan, is kind and gentle. She shares her home with a wise Swamp Monster named Glerk and a Perfectly Tiny Dragon, Fyrian. Xan rescues the abandoned children and delivers them to welcoming families on the other side of the forest, nourishing the babies with starlight on the journey. One year, Xan accidentally feeds a baby moonlight instead of starlight, filling the ordinary child with extraordinary magic. Xan decides she must raise this enmagicked girl, whom she calls Luna, as her own. To keep young Luna safe from her own unwieldy power, Xan locks Luna's magic deep inside her. When Luna approaches her thirteenth birthday, her magic begins to emerge on schedule-but Xan is far away. Meanwhile, a young man from the Protectorate is determined to free his people by killing the witch. Soon, it is up to Luna to protect those who have protected hen-even if it means the end of the loving, safe world she's always known. "There is magic in starlight, of course. This is well known. Moonlight, however. That is a different story. Moonlight is magic. Ask anyone you like." "Barnhill is a fantasist on the order of Neil Gaiman." "[The Witch's Boy] should open young readers' eyes to something that is all around them in the very world we live in: the magic of words." "This spellbinding fantasy begs for a cozy chair, a stash of Halloween candy and several hours of uninterrupted reading time." "Impossible to put down . . . The Girl Who Drank the Moon is as exciting and layered as classics like Peter Pan or TheWizard of Oz." "A gorgeously written fantasy about a girl who becomes "enmagicked" after the witch who saves her from death feeds her moonlight." "[Barnhill's] next middle grade sensation." "With compelling, beautiful prose, Kelly Barnhill spins the enchanting tale of a kindly witch who accidentally gives a normal baby magic powers, then decides to raise her as her own." "Guaranteed to enchant, enthrall, and enmagick . . . Replete with traditional motifs, this nontraditional fairy tale boasts sinister and endearing characters, magical elements, strong storytelling, and unleashed forces." "Rich with multiple plotlines that culminate in a suspenseful climax, characters of inspiring integrity, a world with elements of both whimsy and treachery, and prose that melds into poetry. A sure bet for anyone who enjoys a truly fantastic story." "An expertly woven and enchanting offering." "Barnhill crafts another captivating fantasy, this time in the vein of Into the Woods . . . Barnhill delivers an escalating plot filled with foreshadowing, well-developed characters, and a fully realized setting, all highlighting her lyrical storytelling." "Barnhill writes with gentle elegance, conveying a deeply emotional and heartrending tale with accessible, fluid prose. Characters are skillfully developed: the heroes are flawed, the villains are humanized, and they are forgiven for sins they may or may have not intended. The swamp monster and dragon provide plenty of moments of humor to leaven the pathos, while the setting is infused with fairy tale elements, both magical and menacing, and given a tragic history. Fans of Barnhill's The Witch's Boy and Iron Hearted Violet will find similar intersections of love, loss, and identity here." "The Girl Who Drank the Moon takes a probing look at social complexity and the high cost of secrets and lies, weaving multiple perspectives, past and present, into one cleverly unfolding fairy tale. Barnhill crafts wonderfully imperfect characters with poetic prose, warmth and wit. The resiliency of the heroes may be partly because of magic, but also because of critical thinking, empathy, deep love and the strength of family in all its unconventional manifestations. Thoughtful and utterly spellbinding." "Heart-stopping and heart-rending . . . Good and evil square off in this highly original fantasy that satisfies in time-honored ways . . . Poetic turns of phrase, intriguing subplots and fast pacing yield a rich mix of suspense, surprise and social commentary, splendidly exploring 'memory, hope, love, and the weight of human emotion.'" "Magic, witches, moonlight, starlight, a baby dragon and baby sacrifice swirl together in this spell-binding high fantasy." 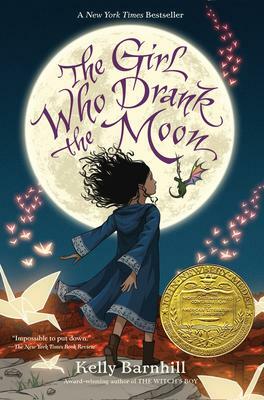 "If your kids have already read Harry Potter and the Cursed Child, and they can't get enough of Neil Gaiman, they're going to love Kelly Barnhill's new fantasy, The Girl Who Drank the Moon." "The Girl Who Drank the Moon is a story of love, curiosity and the magic of the everyday world . . . this is a novel about the journey, not the destination -- one filled with wisdom and heart." "Magic, witch-lore, an evil Council of Elders, a Perfectly Tiny Dragon, twists and turns and an utterly fantastical world--this book keeps you hooked!" "An involving--and often wondrously strange--adventure. Though aimed at middle grade readers, this has plenty of marvels and tongue-in-cheek moments to keep older readers entertained as well." "Infused with unique forms of magic. Philosophy and plots intertwine, woven together with bejeweled language and themes of love, secrets, power, belonging and family." "A fresh take on fantasy." "This story of a girl who gains magical powers after a witch saves her life by 'feeding her moonlight' has drawn comparisons to The Wizard of Oz and Peter Pan." "There's much to love about this fast-paced story. The characters are charming, good and evil battle it out in scenes that keep the pages turning as the story builds to its climax, and the real witches come out of the woodwork. There are plenty of surprises as the author wends her way to a conclusion, leaving not a single stone unturned. Children, and adults too, will be "enmagicked" by this addictive tale." "A delightful read, especially for upper elementary and middle schoolers who love traditional fantasy." "Refreshing, magical, oftentimes comical, and full of adventure and heart, The Girl Who Drank the Moon soars off the pages. Readers will be fascinated in a spell that will sing to them and wrap them up in a finely woven tapestry of fantasy and magic. Few storytellers have the gift of so deftly arranging a fantasy or building a world so magical that readers want to live there, but Kelly Barnhill is the best at her craft. If you loved The Witch's Boy, you will love The Girl Who Drank the Moon even more . . . An instant classic, a book that today's children will read someday to their children. Highly, highly recommended. I would recommend this book over all others this year. It is honestly the best book I've read in years." "Kelly Barnhill is an artist, weaving a tightly-developed world from prose that reads like poetry. The Girl Who Drank the Moon is high fantasy at its finest and belongs on the same shelf with legendary tales like The Once and Future King, The Hobbit, Susan Cooper's The Dark Is Rising Sequence, and Lloyd Alexander's Chronicles of Prydain." "The Girl Who Drank the Moon is pure magic . . . Barnhill weaves together poetic prose--along with a few actual poems--well-developed characters, a perfectly escalating plot, and a beautiful message to create the extraordinary tapestry of this nontraditional fairy tale that will engage readers of any age." "This entrancing novel is full of beautiful detail with a very well-crafted plot line and exquisitely developed characters. Light and dark magic combine to weave a complex, twisting vine of a tale." "From pure hearted characters to beautifully detailed backdrops, everything about this story is truly mystical . . . The Girl Who Drank the Moon is an unforgettable story that is so beautifully written it must have taken magic to write it." "It is the strong element of emotional entanglement between parents and children that sets this book apart from the bursting shelves of middle grade fantasy. Barnhill does an excellent job of reminding us that, while sorrow can be a dangerous and overwhelming force, love is an even greater magic." "Just lovely--a worthy precursor to authors like Gaiman and LeGuin. Barnhill has a knack for telling a complex story in deceptively simple, lyrical fairy tale language, and the way she teases the individual threads of this story together--the brave boy, the magical girl, the witch's forgotten history, the mad mother--is brilliant. The characters--minor and major--live and breathe; the world of the story feels sturdy enough to stand on its own . . . go ahead and add The Girl Who Drank the Moon to your reading list." "This fantasy book about the unexpected power of magic, love and sorrow is told with beautiful prose and some humor . . ."
"Get lost in the magic of a middle grade read with The Girl Who Drank the Moon. Beautifully written and poetic, this is a tale that defines magic and love in a whole new light . . . Kelly Barnhill has a magical way of bringing a story and moral to light, while delicately dealing with deep issues. Perfectly suited for young readers, this book is also entertaining for an older reading audience." "A page turner for all ages. A rich cast of characters that includes a highly intelligent swamp monster, a tiny dragon, and a child imbued with powerful magic form the heart of this enchanting middle grade novel from Barnhill, who weaves an engrossing plot involving family, truth, and sacrifice." "The Girl Who Drank the Moon is a marvelous children's story about fear, secrets, and the power of love . . . a wonderful book that older children and teens should enjoy reading." "Sure to delight readers of other fairy tale-style stories like Neil Gaiman's Stardust with its deliberate mixture of allusions, satire, and playfulness." "This novel is as magical as the magic that threatens to burst from Luna. There is no way to escape its touch as you dream through the pages. It has everything a good story needs - a mystery that is not figured out by the reader until the very end; several unlikely heroes, as well as an unconventional family; so much love mixed with so much pain and sorrow; and magic so unbelievable, it becomes as believable as the age of its painter. Read this book." "A fantasy set around Luna, a girl whose magic begins to emerge on her thirteenth birthday, set in a rich fantasy world." "A misunderstood witch, a poetry-spouting swamp monster, a tiny dragon with a simply enormous heart, a girl fed from moonlight and a town filled with tragic sadness all come together in this brilliant new novel from the author of Witch's Boy. Fans of Maile Meloy, Alice Hoffman and Shannon Hale will devour this sad, funny, charming, clever stand-alone fantasy adventure." "A spellbinding book that will keep you at the edge of your seat . . . Not only does the story show compassion and hope, it shows unconditional love . . . Look for this book to become a classic . . ."
"A modern fable about a witch named Xan, who accidentally gives a baby moonlight instead of starlight, and the child, Luna, who grows up to be magical and dangerous. Factor in a Perfectly Tiny Dragon, a swamp monster, a not-so dormant volcano, and a mysterious woman with a tiger's heart and, well, you've got something truly magical." "Barnhill's impeccable writing makes for effortless reading, while she spins her plot with perfect pacing. Packed within the story are some tremendously thought-provoking themes which elevate this quite beyond an ordinary fantasy and make it a superb choice for a middle-grade-and-older book club." Kelly Barnhill lives in Minnesota with her husband and three children. She is the author of four novels, most recently The Girl Who Drank the Moon, winner of the 2017 John Newbery Medal for the year's most distinguished contribution to American literature for children. She is also the winner of the World Fantasy Award, the Parents' Choice Gold Award, and the Texas Library Association Bluebonnet Award, and has been a finalist for the Minnesota Book Award, the NCTE Charlotte Huck Award, the SFWA Andre Norton Award, and the PEN/USA literary prize. Visit her online at kellybarnhill.wordpress.com or on Twitter: @kellybarnhill.